I'm Here. I'm Queer. What the Hell do I read? : The SCBWI 2010 Summer Conference: Day Two!! Gordon Korman, Marion Dane Bauer, E.B. Lewis and Gail Carson Levine are all giving keynotes in the main room today! And there's a morning literary agent panel with Ginger Clark (you can check out my fellow SCBWI Team Blogger Jolie Stekly's pre-conference interview with Ginger here), Lisa Grubka, Ken Wright, and Josh Adams (check out my pre-conference interview with Josh here!) that should be really interesting. There are fantastic morning and afternoon workshops - including an afternoon workshop called "A Look at the LGBTQ Marketplace" with Arthur A. Levine, Aaron Hartzler, and Tony Valenzuela . Oh, and me! 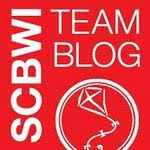 Yes, It's my 1st time on an SCBWI Panel - I'm excited and honored and have so much to share... and did I mention I'm excited? There's a lunchtime Los Angeles Region Meet-and-Greet in the hospitality suite, so if you're a local, stop on by and say "Hi" to Claudia Harrington, and Edie Pagliasotti, our Regional Advisors, and Sarah Laurenson, our ARA! And today also boasts the illustrator's portfolio showcase from 5:30pm-7:30pm, and, of course, the Dinner and Poolside GALA, "Heart and Soul Celebration." I'll be wearing some kind of red... and will be blogging and dancing up a storm!